*50%Off Discount for Couples on Wednesday Candlelight Dinner&Ball Dance on Romantic Music. 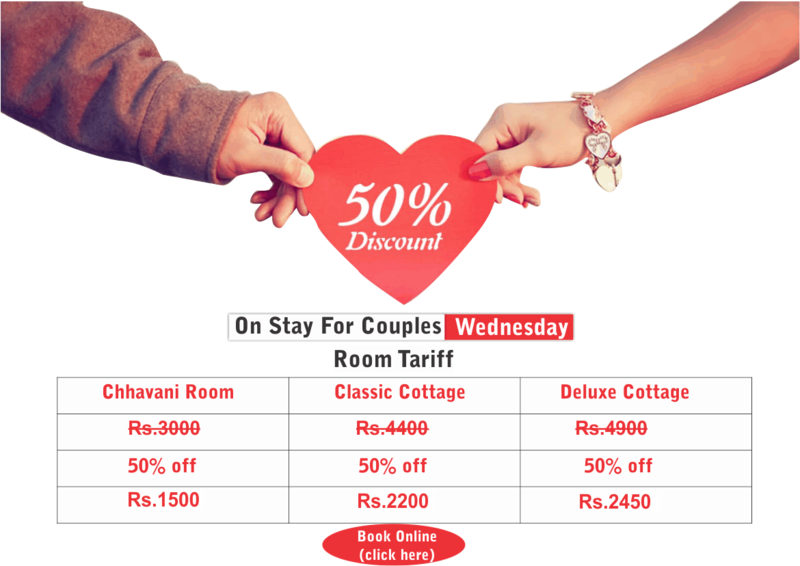 * To know Today's Best Rates click on Book Online. *Advance Booking is Compulsory,No walk in’s will be entertained.Entry Allowed only for Members,Invitees&By Bookings. *Check In not allowed after 8.00 p.m.
*Smoking in the Restaurant is Strictly Prohibited.For any special needs please contact the Management. *Only Stags Bookings are not allowed.We take Family or Corporate Bookings. *Access to the Driver in Guest Area,Front Office,Gaming Zone,Pool&Water Park Area,Cottages Area is Strictly denied.Entries in such Area for Driver is prohibited.Only Self Driven Vehicles are allowed beyond Sun Gate.Guest are requested to instruct there Drivers accordingly. *Videography/Photography with Mobile Phone/Camera is Strictly Prohibited in Pool&Water Park Area.Similarly it is prohibited to take a Photograph or Video of any other Guest without their consent in Entire Resort Premises. *Check In Time:4.00 p.m.,Check Out Time:2.00 p.m.(22 Hours Stay,Timing Slot depend upon Subject to availability). Mantra is not a Public Place.Right of admission is reserved.Entry is restricted to Members,Invitee&By Bookings. Within 30 days advance notice,10%will be charged as retention charge. Within 30-15 days of date of arrival,50%will be charged as retention charge. Within 15-07 days of date of arrival,75%will be charged as retention charge. Within 07 days of date of arrival no refund. Retention will be levied for all days of confirm booking in case of no show. ©2018 Mantra Resort.All Rights Reserved.